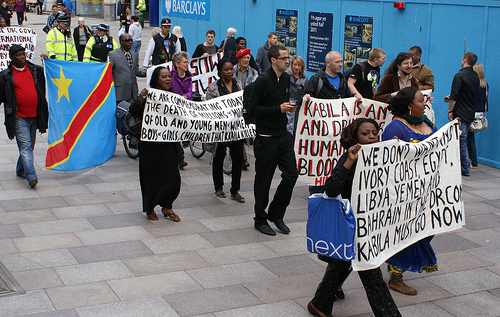 On Friday 13th May the Congolese community came together for a lively demonstration against the potential re-election of President Joseph Kabila, a man surrounded by corruption and with his vice-president facing charges of war crimes in the Hague. The demonstration marched from City Hall, along Queen St through the city centre accompanied by songs and chants. Friday shoppers stood aside as the small but colourful demonstration swept past. The demonstration then proceeded by foot to the Bay to hand a signed letter to the Welsh Assembly Government. This news demonstrates the relentless violence going on in many parts of the DRC. However, whilst the country continues to be occupied by militias, the Home Office, the UK Border Agency and the EU still feel it appropriate to deport refugees en masse back to the DRC. No Borders has reported previously on expulsion flights leaving the UK for DRC. Most recently on Thursday 28th of April a Frontex charter flight deported people from the UK before leaving for Brussels and ultimately Kinshasa in the Democratic Republic of Congo. Really sorry to have missed this demo – but pleased it went so well. Looking forward to the next. Solidarity.